What do daycare centres in Quebec have in common with a non-profit organization that cleans up graffiti and replaces it with art murals? Both are rooted in social innovation, at different scales, and both represent the type of change that Saint Paul University’s new Élisabeth-Bruyère School of Social Innovation wants to inspire. By developing five different degree programs and creating a collaborative workspace, Saint Paul is thinking big about social innovation. Political science professor Simon Tremblay-Pepin, the school’s director, is optimistic that with the renovations currently under way at the university, the collaborative space will be ready by the time the first students start their courses in September. 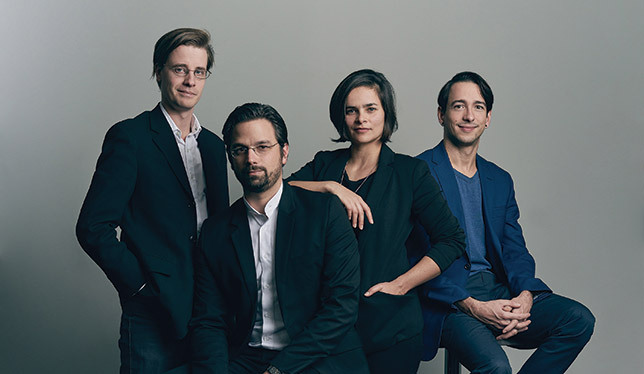 The inaugural faculty of Saint Paul University’s new Élisabeth Bruyère School of Social Innovation, including director Simon Tremblay-Pepin (far left). A term that has been trending for some time, “social innovation” in fact refers to a specific approach to problem-solving. “When communities are grappling with problems and decide to solve them themselves, without directly appealing to the government or the private sector, that’s social innovation,” explains Dr. Tremblay-Pepin.